Arrow Health & Safety is a leading provider of first aid and safety supplies for businesses throughout the U.S. We pride ourselves on delivering quality products, professional service and great value. Arrow Health & Safety will maintain and service your first aid cabinets and replenish consumed supplies. Professional first aid service, combined with employees trained in emergency treatment, can reduce on-the-job injuries, illnesses and absences. We'll manage the details for you, ensuring the proper implementation and maintenance of your company's first aid and safety program. Enabling your work force to treat minor injuries and symptoms of discomfort can help them stay on the job and improve their productivity. If life threatening injuries occur, employees trained in the use of advance safety equipment can stabilize the individual until medical help arrives. The presence of properly stocked and maintained first aid kits will contribute to a healthier, more productive work force and quite possibly save a life. Contact us today to speak to a trained industrial safety specialist! Arrow Health & Safety realizes that minimizing injuries and increasing safety awareness are essential. Injuries in the workplace are responsible for millions of dollars in lost revenue, increased workers compensation claims and soaring medical costs. The training list below covers the most frequently cited violations, leading the way to significant fines and citations annually. Arrow Health & Safety instructors will be able to conduct simulated walkthroughs and generate a report identifying issues that typically would result in costly citations. Free Safety Evaluations - Call Today! We provide free monthly inspections of your first aid cabinets, eye wash stations, disaster supplies and oxygen to ensure that your company is in compliance with federal workplace safety regulations. 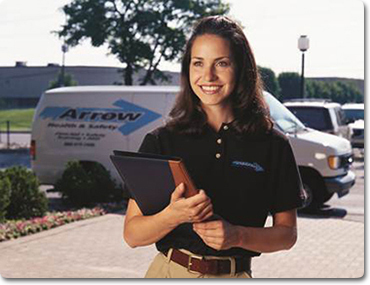 Arrow Uniform has saved countless companies countless hours and significant fines over the years at a fraction of what a visit by OSHA/MIOSHA would cost. 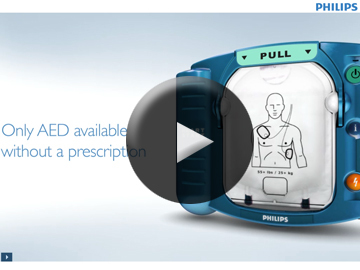 Watch the video below to learn more about our AEDs. For additional training videos, click here to visit us on YouTube! on-the-job injuries for your work force! When someone suffers sudden cardiac arrest, minutes matter - seconds count! Officially licensed team gloves are a great way to represent your team and be safe at the same time! At Arrow Uniform, we carry the widest selection of paper products to fit your need! Quality protection for your most valuable tools. 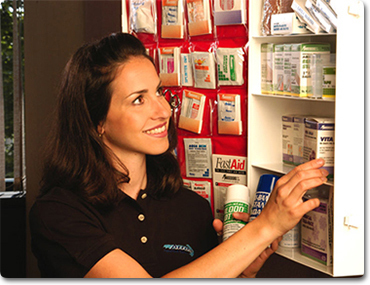 Take a peek of all that we offer within the first-aid cabinet. Make sure you and your employees are prepared, even for the unexpected! Say goodbye to odor for good! Improve the hydration and performance of your employees!